The American love affair with lush, green grass is well documented. At first glance, it's hard to argue with the uniform sea of green that connects one home to another. A lawn is a summer haven where children run barefoot, toss balls, and do cartwheels. The mere thought of sipping a cool drink or reclining with a good book, while wriggling your toes in the grass, can be enough to get you through the day. Even the early morning hum of a neighbors' mower is pleasant, because it means summer is here. The smell of fresh cut grass is said to release endorphins. What price do we pay for the sought after "sea of green," though? Each year, Americans spend more than $40 billion on lawn care. Because grasses used in most U.S. lawns are not native, we use 90 million pounds of fertilizer and 78 pounds of pesticide to keep things green. The Environmental Protection Agency estimates that nationwide, landscape irrigation accounts for 9 billion gallons of water a day. Yet lawns bring great pleasure, add to curb appeal, and cover bare ground. 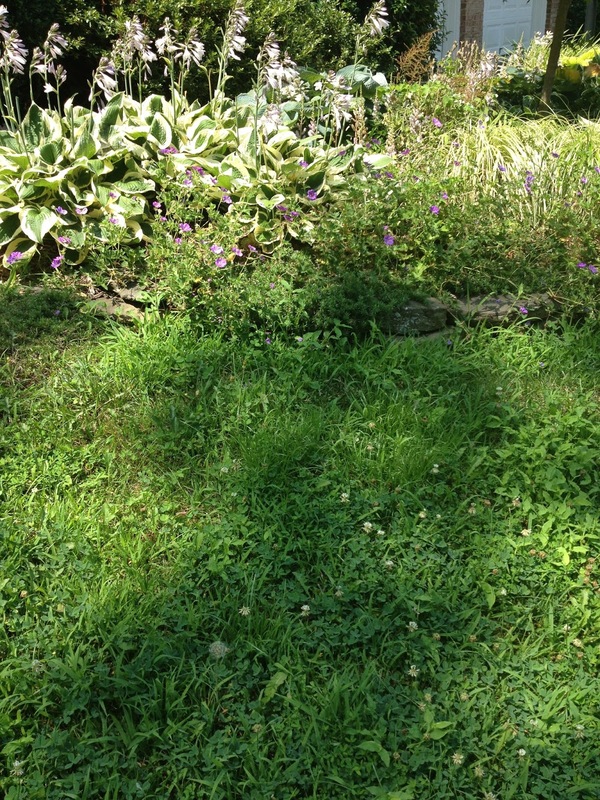 Is there a happy medium between green grass and crabgrass? To achieve a great lawn, we need to "think green," both environmentally and financially. Our yards don't need to hurt the environment, or our wallets. There are alternatives to grass that are far more satisfying and enjoyable. 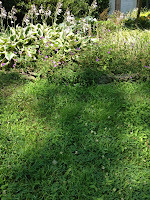 One option is to reduce lawn and grow native plants. Native plants require very little maintenance, look good, and provide sustenance for pollinators. Because they are well-suited to local soil, native plants require no fertilizer or pesticide. That means less pollution in our watershed and healthier eco-systems. Rainfall is often enough to keep things going, which means less overall water use. 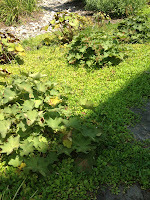 "Steppable" groundcovers may also take the place of grass. They tolerate moderate foot traffic and come in evergreen and flowering varieties for sun and shade. 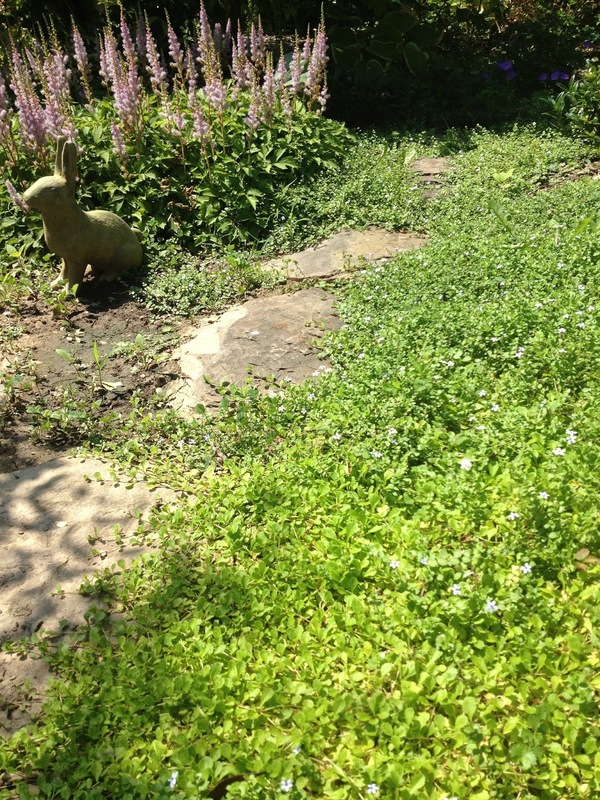 We've had great success with Blue Star Creeper, Elfin Thyme, and Mazus. These plants may require an initial investment, including soil amendment, but over the long-term they're low-maintenance and add color and texture to a no-mow landscape. Clover: it still feels good between my toes. Another lawn care choice is to let it grow. Let the dandelions and wild violets bloom in spring. Mow it down before it goes to seed, and you'll be surrounded by green again. 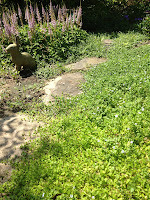 Let the clover spring up and give the bees a chance to make their honey. Mow it down again, and you'll see green, green, green. Let it go. When you hear the hum of your neighbor's mower and see his lush lawn, sit back and chuckle. You're saving money, time, and the environment. All by doing nothing.